A good diet can help prevent disease and ill health. Food is also restorative, helping our bodies to heal. 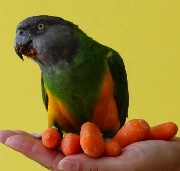 Providing a parrot with a varied diet is important both for physical nutrition as well as mental joy and satisfaction. Enrich your parrot’s life with a plentiful VARIETY of fresh, wholesome foods, and a quality organic pellet. Calcium is a key element for all parrots. Calcium-rich foods include leafy greens, carrots, unhulled sesame seeds, broccoli, dandelion and other greens, yogurt and almonds. To absorb calcium, vitamin D3 is needed, which can be acquired through sunlight naturally, or in pellets as a supplement. Let your parrot enjoy some safe time outdoors or provide access to a full spectrum light. Light filtered through window panes is not full spectrum. Foods which help produce vitamin A are also essential for parrots. Deep orange vegetables and fruits are rich in beta carotene (yams, pumpkin, carrots, winter squashes, mango, papaya, apricots and cantaloupe) as well as palm oil, leafy greens and broccoli. Make vitamin A and calcium-rich foods a regular staple in your bird’s daily diet. Most parrots enjoy grains. These can be cooked, sprouted or simply soaked. There is a wide variety to choose from such as quinoa, groats, spelt, kamut, rice, amaranth, buckwheat and barley. Combine grains along with recommended legumes such as lentil, garbanzo, adzuki or mung for complete protein. Other sources of protein include cooked salmon or trout, tuna, chicken, chicken bones, quinoa and occasional egg dishes. 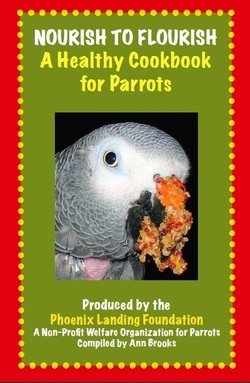 Most parrots relish these foods and will savor every morsel. 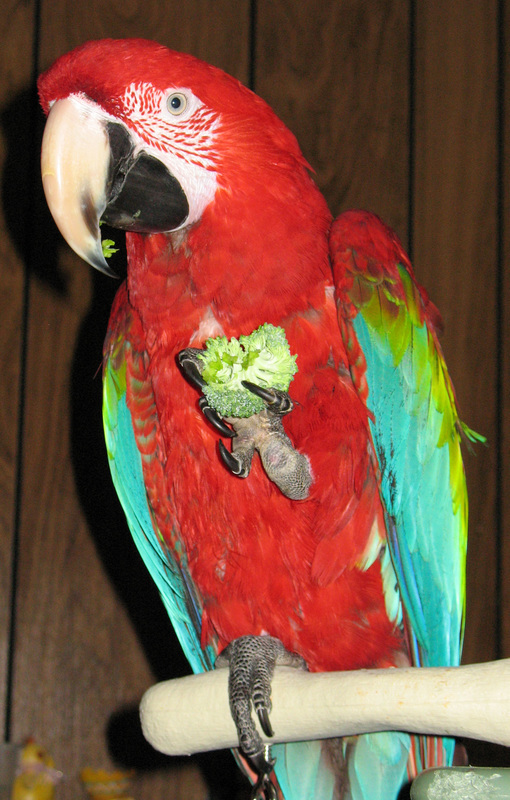 Healthy seeds contribute to the health of your parrot. These include: sprouts, soaked or sprouted grains, legumes, nuts, pumpkin seeds, flax seeds, and sesame seeds. Please do not feed your bird a packaged “bird seed” diet. Not only does this diet lack essential ingredients like vitamin A, calcium and protein, but most packaged seed diets are high in fat and lead to ill health. Smaller birds such as parakeets, cockatiels and lovebirds need more grains than pellets; such as oat groats, flax, canary seed and other grains. Fruits are a delectable part of the diet of many parrots. Darker fruits such as mango, papaya and pineapple provide the best nutrition. White-colored fruits such as grapes have higher levels of sugar so use those more sparingly. Keep dried fruits to a minimum and make sure they are always unsulfured. Essential fatty acids (EFAs) support key functions of the body and must be obtained through the diet. High sources of EFAs include flax seeds and oil, walnuts, pumpkin seeds, leafy vegetables and fish. Parrots evolved to eat natural, unprocessed foods. Look for pellets with organic ingredients (no dyes). Avoid extruded pellets made with high heat which greatly lowers the nutritional value. Change the water frequently to help prevent bacteria, but give your bird a chance to enjoy this “water feature.” Many birds dunk their food or take a bath in their water dish. Pay attention to what your bird actually eats, not just what you provide. If your parrot has not learned to eat fresh foods, try mixing minced food into pellets or seed, make a warm mash with a favorite item sprinkled on top to create curiosity, or play a game and show your parrot that it is yummy to eat a particular food. 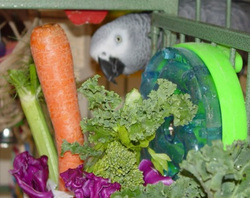 Don’t give up, your bird can learn to enjoy healthy foods in addition to pellets!